San Francisco Chinatown is the largest Chinatown outside of Asia and the oldest Chinatown in North America. This neighborhood is one of the most popular attractions in San Francisco, and I couldn’t miss out on the best ramen and shopping in the city. It’s that good. We kept finding ourselves back there again, visiting the same restaurants and walking the same streets. This 24 city blocks long neighborhood is one of the top tourist attractions in San Francisco for a good reason. It’s easy to spend a day here, exploring the streets and alleys, browsing the shops and enjoying the authentic Chinese food. Chinatown is where the village of Yerba Buena, later to be San Francisco, started. Portsmouth Square had the first houses in the city and Grant Avenue was San Francisco’s first street. The mad rush to dig for gold brought thousands of men to the port town of San Francisco, including many Chinese, who settled in the streets near the bay. During the late 1800s Chinatown was a dense, poverty-stricken ghetto populated by recent immigrants. Later, the entire neighborhood was destroyed in the fire that followed the 1906 earthquake. After narrowly escaping being moved to Hunters Point, the Chinatown neighborhood was rebuilt by commercial interests. 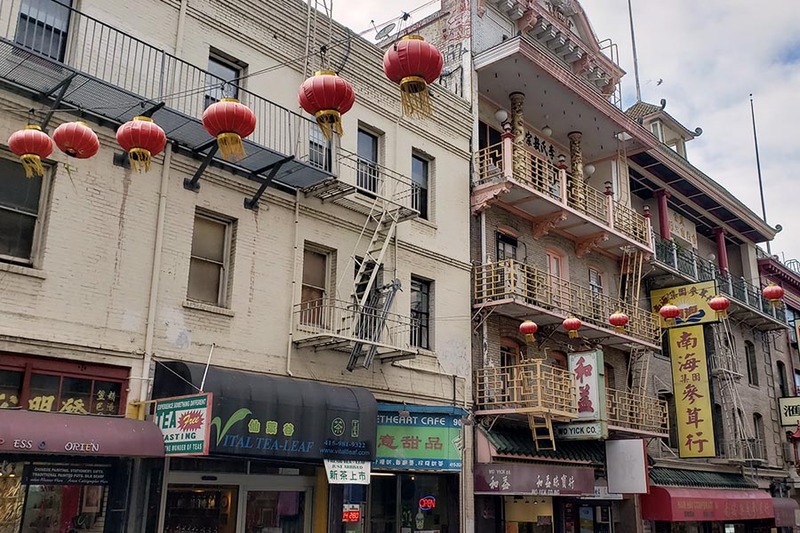 San Francisco’s Chinatown is the most densely populated neighborhood in California. Almost all the residents are Chinese and speak little English. It is also one of the poorest areas of San Francisco. While some visitors stick to strolling down the picturesque Grant Avenue, others wander through many side streets and alleys to explore the authentic life of the community. We did both and here are some of my recommendations. The dragons, fish and big lions on this ornate pagoda-topped gate guard the southernmost entrance to Chinatown. The gate is an authentic entry gate like those seen in Chinese towns, and was a gift from Taiwan in 1969. Also known as Gateway Arch, this is the only authentic Chinatown Gate in North America. Traditionally, the gates have three passageways: two small side ones for commoners and a large center passageway for dignitaries. Built in 1854 (rebuilt 1909 after the earthquake fire) this beautiful Catholic Cathedral was the first Asian church in North America. The oldest Taoist/Buddhist temple in the United States to honor the Goddess of Heaven and Sea, Tien Hau. If you want to see inside the place of worship, a small $1 donation is suggested but not required when you visit the Temple. This historical birthplace of San Francisco is now an open plaza for residents. It is one of the few open spaces in Chinatown and sits above a large underground parking lot. Portsmouth Square bustles with activity such as T’ai Chi and old men playing Chinese chess. Since 1962 this factory makes approximately 20,000 fortune cookies in a month. The flat circular cookie dough is pulled off a hot press, after which a paper fortune is attached, and then the dough is reshaped over a steel rod into the final fortune cookie … by hand. Taste a free hot sample, take a picture for $.50, or buy a bag of cookies for $3.50. There are so many different shopping opportunities here – everything from bargains to higher-end items. Even if you’re not looking to buy anything, it’s fun to browse. Most of the gift shops are on Grant Avenue, but be sure to wander off the main streets to explore the side streets and alleys. Stockton Street is where the Chinese residents shop for groceries and every day needs. The street runs parallel to Grant Avenue, it has lower prices and authentic Chinese atmosphere. Hong Kong Clay Pot Restaurant – Plenty of awesome choices at decent prices. Good Mong Kok — Take-out dim sum. If you go, order shumai and shrimp dumplings! New Moon restaurant — Get a quick stand-up meal at one of those places which have whole roasted ducks hanging in the window. Chong Qing Xiao Mian – Here we had awesome Sichuan noodles: pork belly noodles with pickled mustard. Tell Me: What is your favorite San Francisco neighborhood? I’ll be making my first trip to San Francisco next week so this is perfect timing. I’ll have to hold out on my favorite neighborhood until then! I hope you enjoy your trip! San Francisco is magical! I dont live in California, but I SO want to visit now. Great post and photos, loved it! Thank you! I hope you can go soon. It was my first time in California and I can’t wait to go again!